Origin and Habitat: Endemic to the Kerala region of India and found in lakes and slow-moving rivers with plenty of submerged vegetation, leaf litter and sunken wood. Compatibility/Temperament: These fish are highly aggressive despite their size If adding tank mates one should use caution as they will nip the fins of slow moving fish. Water chemistry is not a major issue and dwarf puffers adapt well to a broad range of conditions. Provided extremes are avoided. Ideal conditions would be around pH 7.5, 10dH for general maintenance, though somewhat softer conditions may be required for spawning. Temp should be 77 and 82 degrees F.
A truly beautiful fish. 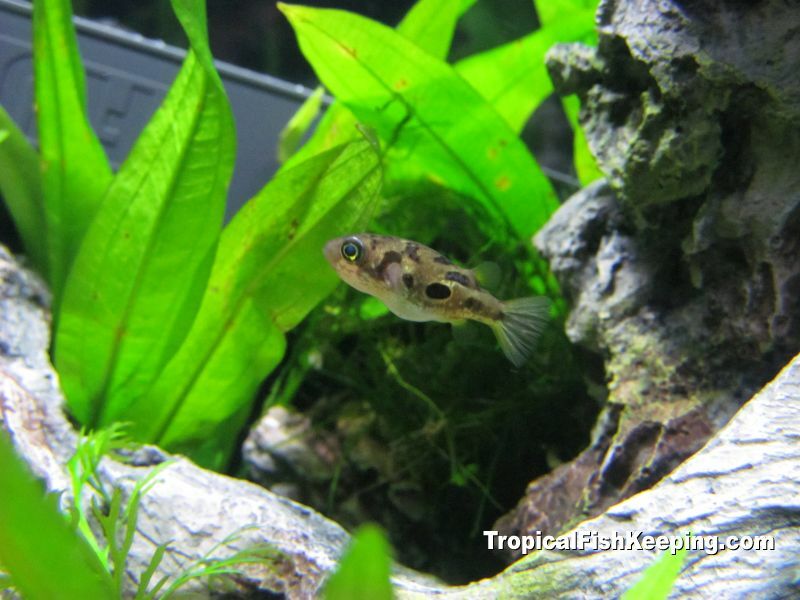 Its one of the smallest Puffers to be found. Males will have a dark line that runs down their bellies ( This will darken will sexual maturity and during spawning times.) They will also have more of a yellow belly. Males will also have lines or wringles behind their eyes. Females do not have these traits and their bodys are generally more round then the males. Even though these fish are small just barely measuring an 1 inch they require tanks big enough to be able to accommondate their personalities and messy habits. These fish are very curious and the tank should be heavily planted and have lots of driftwood in the tank for them to explore. This also serves as a way to break up the line of sight when housing more then one puffer. If the tank is bare they will get bored very easy and start to tank surf (swimming up and down the glass). They will often learn that your presence means food and will come out to the front of the tank anytime you walk near it. General Rule when housing more then one puffer in the same tank is 1 puffer for the first 10 gallons and then 5 gallons per fish after that. In bigger tanks housing more then one puffer its best to have just one male. Having more then one male in the tank can result in fights and even death. Last edited by Byron; 05-24-2013 at 06:59 PM.